Moles have been considered a sign of beauty. One or two moles on the face. An example would be Marilyn Monroe. Unfortunately, most people are not blessed with a complimentary facial mole. But for some they have multiple moles on the face, neck, arms, legs, chest and ears. Moles are cells that grow in clusters. Generally, moles appear in a persons late 20 years and some appear later in life. Mole cells are called, melanocytes. Generally round and colors tend to be brown but can vary in color. Many birthmarks are moles. Moles tend to darken when exposed to the sun, during pregnancy and in the teen years. Over the years some mole change in size and color, some may develop hair or some may disappear on their own. In adulthood some people may have 40 or more moles and or skin tags. 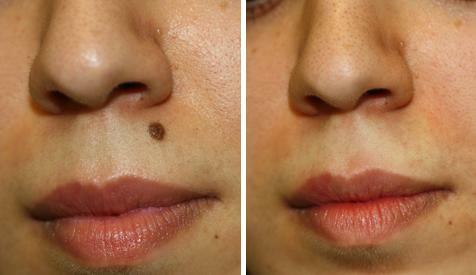 When moles are removed they do not come back but new moles may appear in different areas of the body. Compound Moles colors vary from tan to dark brown and raised above the skin. Dermal Moles hair growth combined with mole growth. Generally, found in upper body area. Color can be the same as body color to dark brown. Blue Moles color can vary from blue to brown. Raised above the skin and more predominate in women than men. Sebaceous Moles yellow in color tender to touch. Caused by the bodies over-active oil glands. Applying grounded garlic clove and apply on mole. Cover with a bandage. Can burn skin. Grounded coriander applies to mole. May remove moles in a few days. Grounded flax seed and honey. Apply to moles 2-3 times a day until mole falls off. Rub root of dandelion on mole 3-4 times a day. Scratching mole and applying apple cider vinegar, garlic or iodine. Can cause scarring and infection. Baking powder and castor oil paste. Apply 3 times a day until mole is gone. Apply tea tree oil to mole area for approximately 10 days. Natural skin mole removal crème (over-the-counter). Toxic skin mole removal crème (over-the-counter). Determine medical technique for removal. Cost for mole removal includes: surgery or laser removal. Laser removal not recommended on deep moles. Cost can vary from $150.00 to $300.00 per mole. Mole can be removed partially or completely. Discuss options and advantages with doctor. Moles maybe removed with or without stitches. Discuss options with doctor. After surgery pain can result. Can leave scarring but discuss with doctor if there is a possibility of scarring. After surgery area has to be keep clean and freedom of stress or trauma to the area. Discuss with doctor the healing time after medical removal. Most moles harmless or benign but if mole is precancerous or cancerous consult a medical doctor. No removal methods should apply before consulting with doctor. No treatments should be applied if mole is painful, tender to touch, bleeding, oozes, and itches or appears scaly.